Dipika Kakar Shops Till Husband Shoaib Ibrahim Drops And These Pictures Are Proof! The weekend is the time to unwind with your loved ones and Bigg Boss 12 winner Dipika Kakar shows fans how to do it the right way as she floods social media with latest pictures and videos from her Dubai vacation with actor-husband Shoaib Ibrahim. If the scenic beauty of the place was not enough to make fans weak in the knees, Dipika and Shoaib shared several pictures ranging from the mall and underwater zoo, which is sure to make fans, especially those working this weekend, envious. 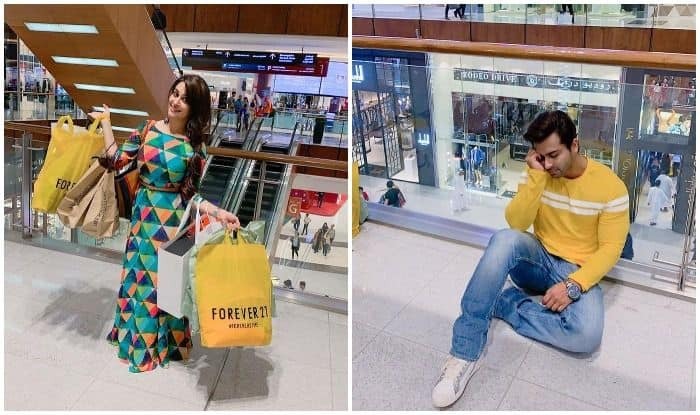 In one post that Dipika shared on her Instagram handle, the actress can be seen holding a plethora of shopping bags while Shoaib, like a typical husband, was seen down on the floor with boredom. Dipika captioned the post as, “Shop till you dropppp!!!! Its the 1st day in Dubai!!!! #DubaiMall See the next pic… to see whats happened to the husband!!! @shoaib2087” (sic). Another picture showed Dipika donning a cute Minie Mouse Tee while standing in the midst of a splendidly lit pathway. The cute pic was captioned, “Capturing the beauty of this place and falling in love with every bit of it!!!! DUBAI” (sic). The Bollywood Parks in Dubai saw an ecstatic Dipika posing with her hands in the air. “Dil Se Bollywoodwaale!!!! !” (sic) read the caption of the picture. Bigg Boss 12 winner Dipika Kakar and her husband Shoaib Ibrahim celebrated their first wedding anniversary last month and the two, who were dressed in white, looked all loved-up as they posed for photographs. Dipika had started dating Shoaib, who was her co-star on TV serial Sasural Simar Ka, in 2013 and the two had tied the knot on February 2018. Dipika had converted to Islam and taken the name Faiza. On the work front, Dipika, who has appeared in a number of serials, made her Bollywood debut in movie Paltan last year. Written, directed and produced by JP Dutta, the film was based on the 1967 Nathu La and Cho La clashes along the Sikkim border after 1962 Sino-Indian War. Shoaib too has made his entry into the film industry with movie Battalion 609, which was written and directed by Brijesh Batuknath Tripathi.